They say I’ll Say She Is was plotless, ephemeral; that’s easy for them to say, since the show has not been performed in some 90 years. I say it’s a delightful confection of thoughtful abandon, and you can say that again. 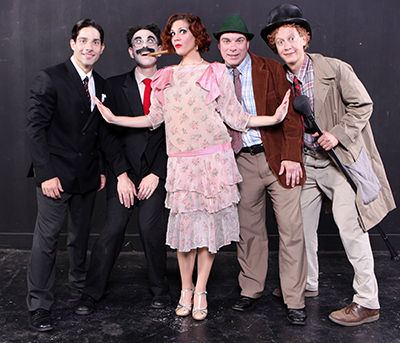 The show (originally by Will B., Tom and Alexander Johnstone), as many know by now, is the only stage production of the Marx Brothers that did not later live on as a well-known movie. Documentation was thus harder to come by, and writer, artist and performer Noah Diamond has reincarnated it from existing drafts, contemporary accounts, consultation with a descendant of the original scenarist and his own well-informed imagination. He was born to revive this show from long before most of us were born, and leading re-historian and neo-dime-entertainment impresario Trav S.D. was born to direct it. The show is in the old-school revue format, which means a minimal plotline and blocks of banter as an excuse to launch into songs and set pieces, and Diamond understands well this form’s fine, fall-over-able line between structural expediency and flat-out surrealism. The bored heiress of the title is wandering a movie-set New York City in search of something to interest her, and show-stopping interludes on an allegorical Wall Street (written five years before that other depression), a trip to (and in) a downtown opium den, and a seedy, blaring Times Square that owes as much to the grungy ’70s heyday of American cinema as to the Hollywood golden age are immortally absurd. A talented cast is free not to re-enact the Marx Brothers’ shtick so much as create it for the first time all over again. Diamond himself as Groucho is miraculous, tapping the source of that comedian’s anarchic essence rather than reconstructing his mannerisms. Groucho’s persona was a weird, prescient dissent to American masculinity, announcing his helplessness at the same time he is enacting absolute (unfit) rule, as we see here in a prolonged and hilarious segment in which he plays a cuckolded Napoleon. Seth Shelden is charming yet quietly troubling as Harpo, who was perhaps the only clown who every really knew how scary he could be, a queasy balance struck en-pointe by Shelden’s meta, masterly performance. The Marx character who of course has worn least well is the Italian-immigrant caricature Chico, but Robert Pinnock, long a virtuoso of luckless everymen, plays him with foibles and dignity that ring very true and drily uproarious. I was always intrigued yet seldom satisfied by Zeppo in the old movies; I found the real him to be played too bland and leading-mannish, when the point is that, in this misfit troupe, good-looking, well-adjusted Zeppo is the freak; Aristotle Stamat’s subtly grandstanding and euphorically-self-impressed take makes the play my favorite story of this character. An expert ensemble of burlesque singer/dancers serve as the show’s Greek Chorus Girls; few have any spoken lines or vocal solos so this is almost a silent-movie role amidst the even more antique form of vaudeville, and two standouts are Melissa Roth, who shows a genius for pantomime (no small claim in a play starring Harpo) by projecting whole life stories of everyone from a flower-peddler to a courtroom bailiff through sheer posture and attitude, and Alexis Thomason, whose shenanigans radiate remarkable fearless joy yet focused presence, no uncommon, um, feet. Trav S.D. himself gives a miniature master class as one of his trademark stentorian, flummoxed authority figures, and his direction is razor sharp and graciously tumultuous; the minimal set’s absence is never noticed, as the cast’s lavish costumes (by Juliann Kroboth), and lavish-er expressiveness, amidst painterly lighting (Tom Bibla) and precise musical scoring (Bibla; Sabrina Chap) put us in the movie Hollywood should’ve made 90 years ago but couldn’t have achieved ’til now. The show at this point surely has a bountiful future, and it pays to look back to a past where anything was worth a try, and the enduring philosophy that reality can be improved on and creative possibility is what you say it is. This entry was posted in Crowded fires, Marxmanship, take two time capsules on August 24, 2014 by adammcgovern46.